If you want a crossover with three-row seating, but don't want to be driving around something the size of a bus, the 2015 Dodge Journey is a great choice for you. Shoppers from Tyler, Greenville, and Sulphur Springs, TX know to choose Sulphur Springs Chrysler Dodge Jeep Ram when they are looking for a good deal on a car or truck. 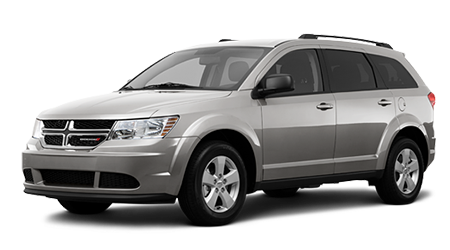 The 2015 Dodge Journey comes in four-cylinder or V6 configurations, as well as with both front wheel and all-wheel drivetrains. The base powertrain is a 2.4-liter four-cylinder, making 173 horsepower, mated to a four-speed automatic with front-wheel drive. Upper-level trim models feature a 3.6-liter V6 rated at 283 horsepower and linked up with a six-speed automatic; these models offer optional all-wheel drive. Four-wheel anti-lock disc brakes and traction/stability control are standard on every Journey. Trim levels start at the affordable American Value Package, then move up thru SE, SXT, and Crossroads, to top-of-the-line Limited and R/T models. The AVP Journey includes power windows and locks, keyless entry, cruise control, dual-zone AC, sliding and reclining 2nd row seating, and a six-speaker touch-screen stereo with CD player, iPod interface, and auxiliary input jack. The SE trim adds LED taillights, tinted windows, along with the options for the V6 and AWD. The SXT trim brings 17" alloy wheels, satellite radio, and upgraded exterior trim with fog lights. An SXT Plus adds a few other items, namely the UConnect infotainment system with a big 8" touch-screen, voice commands, and smartphone connectivity, plus power-adjustable driver and passenger seats. The Crossroads trim comes with 19" alloys, leather upholstery, chrome trim, and the upgraded 8" Uconnect system. Many optional package items from the higher levels are available a la carte on the lower lever trims as well. There is also a Blacktop appearance package with unique 19" wheels and trim available on the Journey SXT Plus. The Journey Limited and R/T trims come standard with the V6 motor for 2015. The R/T comes with a uniquely tuned sport suspension, 19" wheels, heated seats, unique exterior trim, upgraded interior upholstery and a premium sound system with a sub-woofer. The Limited backs off on the sportiness and turns up the luxury level, but otherwise is very similar to the R/T. Standalone options for the Journey include a sunroof, rear-seat video screen, rearview camera, integrated booster seats, and navigation. If your needs occasionally include hauling more than four kids and their stuff, but you want something fun to drive, you owe it to yourself to see the 2015 Dodge Journey. Sulphur Springs CDJR has got them, and we are eager to show them to you!